Warm Your Floor is the #1 nationwide distributor for radiant floor heating mats, cables and snow melting systems. Warm Your Floor engaged EYEMAGINE to help improve conversion rates with an improved user experience (UX). EYEMAGINE analyzed site usage data and created a next-level eCommerce experience that dramatically improved the customer experience and online presentation. Each of these complex integrations and features worked to increase functionality and ease-of-use in their store, helping the company effectively reach their buyer personas. Ultimately, this work won the Interactive Media Council's 2016 Best In Class Award. Features and functions are useful if and only if they support strong user experience. When it comes to purchasing large appliances or expensive features for the home, customers are picky. Buyers do a lot of their own research before buying; they want to know options, installation requirements, and they want certainty that they’re buying the right product. EYEMAGINE’s team helped Warm Your Floor’s customers move through this buyer’s journey with ease and peace of mind. Our custom migrations, extensions, and integrations cut cost, improved user experience (UX), and increased efficiency. The migration from Magento Enterprise to Magento Community edition was a complex undertaking. Enterprise edition natively has more functionality than Community and its database is structured differently, meaning that a successful migration required great care and attention to detail. Warm Your Floor had a list of custom and native Magento Enterprise Edition extensions that needed to be migrated to the Community platform. Many were redeveloped to function properly on Magento Community Edition. EYEMAGINE successfully migrated all existing data, including customer data, product data and order data, effectively saving thousands of dollars without sacrificing any key functionality. Although this worked for Warm Your Floor, we caution all eCommerce retailers to carefully evaluate their business needs, and all options before attempting a similar migration. There is no one-size-fits-all platform solution, and a misguided migration could have serious consequences for an eCommerce site’s effectiveness and stability. Buying floor-warming product can be complicated, confusing, and error-prone. While contractors and industry professionals know exactly what they’re looking for, everyday do-it-yourselfers lack the product knowledge to make a quick and accurate purchase... until now. Warm Your Floor’s custom Quote Builder allows customers to get an exact quote for the floor area they want to heat. In the early steps of the Quote Builder, customers are asked questions about their home and what they are looking for: floor type, subfloor, room shape and dimensions, and more. Based on their answers, they are given the recommended heating products, which can be filtered based on price, ease of installation, custom attributes, and more. Thermostats and accessories are presented that are compatible with each product. At the end of the process, customers have the option to learn more or quickly check out. Once an order is placed, all of the options selected are stored in the Magento administrative interface where customer support can easily access the information and deliver products. This smart Quote Builder increases efficiency and accuracy during the buying process. Customers can easily understand the products they’re buying, in a previously complex sale. They are guided through a simple process that gives customers a properly configured floor-warming kit. Next, EYEMAGINE migrated the company’s “Knowledge Center” from ExpressionEngine to WordPress. EYEMAGINE created an advanced integration between WordPress and Magento. A standard Wordpress-Magento integration allows the site owner to display their featured or most recent WordPress blogs on their website’s homepage. This basic integration ensures that the content on the Magento homepage remains relevant and up-to-date with minimal effort. However, there is very little opportunity for customization or segmentation. Warm Your Floor’s integration is much more advanced. First, the company wanted strong iconography for the Knowledge Center’s homepage and featured categories. It was important for customers to be able to click an icon for each category of blogs and products in the Magento store. The EYEMAGINE team modified WordPress, installed an extension, and customized the extension. Warm Your Floor can now add or update categories at any time simply by selected them as “Featured Categories” in the Magento store. Furthermore, they could have relevant content appear on any page of the site, simply by categorizing a piece of content as “Quote Builder,” “Homepage,” etc., and marking it as a featured article. Finally, our team added and customized another extension that gave the Knowledge Center’s homepage both “Featured Videos” and “Featured Articles” sections, neither of which are default WordPress capabilities. This broadened the page’s reach by educating the user and providing a range of information that speaks to a wide audience. Those who know exactly what they are looking for can click on the Knowledge Center icon of their choice, while those who are simply browsing or looking for general information can refer to the featured videos and articles. Though this already provided a variety of strong material for the customers to choose from, we didn’t want all of this information to be limited to the Knowledge Center. We wanted customers to have the specific information they needed, every step of the way. To allow for this, we added two new categories to the Magento administrative interface: “Associated Blog Posts” and “Associated Blog Categories.” This gave Warm Your Floor the ability to associate a product category with a blog featured category. All related material can be found together on any given page of the site. A site visitor interested in the SunTouch Mats category, for example, would not only see the product information, but also have access to related informational blog articles, how-to videos and a list of compatible products. These customizations made information available in the Knowledge Center and on the site much more dynamic and segmented than a traditional WordPress-Magento integrations. Potential customers have the opportunity to find the information they are searching for, with ease. 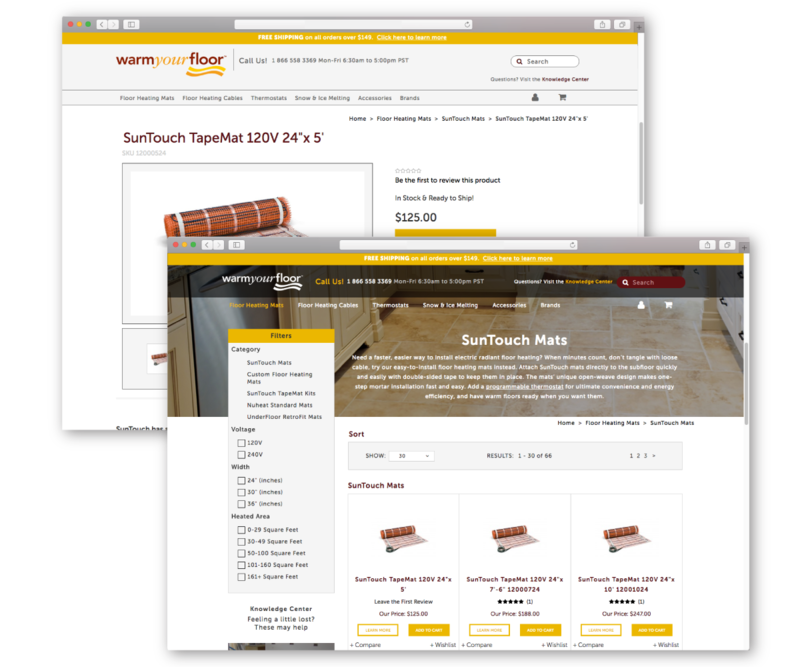 This highly fluid user experience combined with Warm Your Floor’s industry-leading information curation has established Warm Your Floor as experts, increasing customer’s trust in the brand and improving conversion rates. For more information, talk to one of our experts about your online store.